For those of you who don't know, the Childhood Book Nostalgia Project is my quest to find copies of all the books that made the biggest impression on me when I was growing up. It's a pretty long list, because I was a reading sponge as a kid. And as I've grown older, I've realized that a significant portion of who I am today - my attitude toward life, my likes and dislikes, my sense of humor - originated in these books. They're like the source material of my personality. For me, tracking them down is almost like reconstructing a family tree. My goal is not just to find the books I loved, but to acquire editions that are identical to the ones I read back in the day. Same covers, same illustrations, same typeface. Why? Because the look and feel of a book is almost always integral to my memory of it. As I've pursued this quest, I've discovered on more than one occasion that even when I couldn't remember the name of a book, I could (through very, very diligent effort) eventually identify it by the design of its cover or the style of its illustrations. More on that in a later post. So in the case of a book like Little Women, which is available in probably a hundred different editions, the one I wanted was the one I'd checked out from the library at Clement Avenue Elementary School when I was in the fourth grade. It was a 1947 Illustrated Junior Library Edition, with beautiful line drawings and full-color plates by Louis Jambor, and a wonderful picture of the March girls singing at their parlor piano on the endpapers. That edition, and no other. And I found it in a used bookstore in Boston. Check that one off the list. 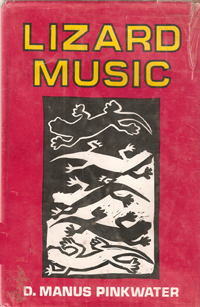 But today I'm talking about what may be my very favorite book of all time: Lizard Music, by D. Manus Pinkwater. As Daniel Pinkwater, the author has written many, many kids' and young adult novels; this is one of his earliest, and to my mind there is nothing in his catalog - and little in the canon of Western literature, to be honest - that tops it. Seriously, this book is awesome. I'll give you a plot synopsis, and I swear I am not making this up. A young boy named Victor is left in the care of his older sister when their parents go on vacation. She promptly runs away with a bunch of hippies, leaving him on his own. He discoveres a band of musical lizards on late-late-late night television and becomes obsessed with finding out who they are. He meets a strange man who wears disguises and keeps a chicken under his hat, and together they make their way to an invisible floating island populated by sentient lizards that are mostly named Reynold, but also Raymond and Helena and other things. I first read Lizard Music when I was about 10. It's the first book I ever remember laughing out loud at, and also the first I'd ever read that had the word damn in it, which seemed incredibly cool when I was 10. My library had a first edition hardcover copy, and I can still see it: a bright pink cover, with a black-and-white Escher-like drawing of stylized lizards in a rectangular frame in the the center, with the title above and the author's name below in block letters. Wrapped in protective clear plastic with a little paper pocket inside the front cover like all good library books, of course. So far I've had zero luck finding this particular book. But when Precocious Daughter turned 10 last year, I bent my own Project rule and bought a new paperback copy of Lizard Music for her. Because I was so eager for her to read it. Also, I wanted to make sure that my memories of its awesomeness were authentic and not simply due to a borderline-psychotic taste for bizarre novels on my part. And of course, I wanted to read it again myself. I'm happy to report that PDaughter loved it. Loved it. Even though I had to explain a few anachronisms to her (like Walter Cronkite and how TV stations used to play the national anthem at the end of the broadcast day), she thought it was as hilarious as I did. So there's a recommendation from two generations.